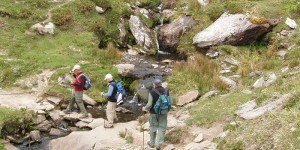 A self guided (independent) 7 night walking holiday on the Dingle Way. Discover the beauty that is the Dingle Way in the south west of Ireland by foot during this self-guided walking holiday. Walk from the small village of Camp near the foot of Slieve Mish Mountains, to the fishing port and bustling town of Dingle and onto the remote areas of Dunquin and Mount Brandon, through one of the last strongholds of the Gaelic language and spectacular scenery, rich in archaeological remains. Embrace the Wild Atlantic Way and enjoy the diversity of landscapes as you pass mountains, corrie lakes and beaches – the setting of many films, including ‘Ryan’s Daughter’ and ‘Far and Away’. This is a one centre holiday allowing you the time to really get to know Dingle. Stay in the famous Benners Hotel, located in the centre of Dingle town. Dingle is a wonderful town, filled with many restaurants to suit all tastes. Certainly the many craft shops, cafes and pubs filled with live music and song are all worth a visit! The average walking time ranges from 5 to 6.5 hours per day, at a leisurely pace. On your arrival, you can make your way to your guesthouse accommodation in Camp. If you have an early arrival you can leave your luggage here and visit the area. Your welcome pack will be waiting for you at the guesthouse. Please see below for information on airport transfers from Kerry or Shannon Airport to Tralee and Camp. Overnight in Camp. Today you cross the spine of the Dingle Peninsula to traverse above the wildlife sanctuary of Inch beach and then on green road and hilltop to the picturesque village of Annascaul, Be sure to pay a visit to the South Pole Inn, the ancestral home of Antarctic explorer Tom Crean. Overnight in Annascaul. Continue along a medieval road to the fishing town of Dingle which is steeped in Irish culture and music and where the locals still speak in the native (Gaelic) tongue. – Boat trip to see ‘Fungi’, Dingle’s resident dolphin. 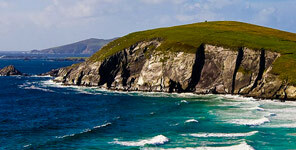 Today’s walking is spectacular, taking you via Ventry Beach and along the slopes of Mount Eagle to Slea Head. This stretch is famous for its concentration of archaeological sites. This leg of the Dingle way takes us north along the Atlantic Cliffs, passing Coumenoole Beach, location for one of the dramatic scenes of the film Ryan’s Daughter and via the first of the beaches of Smerwick Harbour to Cuas Village. Overnight Cuas. Distance 18km/11 miles. Ascent 825m/2,700 ft. This is an exciting day’s walk, which takes you high on the line of a military road to a saddle on the Brandon Mountain Range, then down enjoying spectacular views, to the shore of Brandon Bay. Good visibility – or navigating ability – is required. You will be transferred back to Tralee for your last night. Departure after your full Irish breakfast. Slán abhaile – safe home! Language: Please indicate at time of booking which language you want notes in – English, French or German. Please note for single travellers: If there is only 1 person on the route at any time there will be an extra luggage transfer charge of €100 for the DW7. Walking Grade: 2 boots (most) & 3 boots (Brandon). Moderate walks of 6-12 miles (10– 20km) per day with gradual ascents of up to approximately 2,125ft (650m).